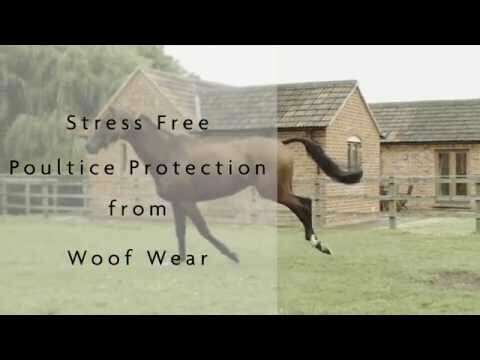 The Woof Wear Medical Hoof Boot is a unique close fitting hoof boot designed to keep wounds, poultices and dressings clean. This boot is suitable for use in the stable and can be used on sensible horses in the paddock. Use the size guide to ensure you have the closest fit for your horse or pony. In some cases the measurements of your horse’s foot may fall across two sizes on the guide. If this is the case, go by the width measurement first as this will ensure the boot is not too wide on the foot which puts it at risk of being trodden on by the opposite foot. Note – the size guide is based on an unshod hoof, if you wish to use the boot with a shoe fitted you may need a larger size. Overreaching - Do not use the Medical Hoof Boot (MHB) in place of an overreach boot to prevent shoe loss. The MHB is not designed for this application and will not protect against overreaching. We recommend always using a generous sized overreach boot over the top of MHB to protect it should your horse stand on himself or overreach. We recommend this on both front and hind hooves. Measure, Measure, Measure... - The MHB is designed to be a snug fit so it doesn’t fall off. If you do not measure accurately or buy a size too big it can result in damage to the MHB due to the boot being trodden on by the other foot. If your horse requires a poultice, put it on the affected area in the normal way and secure it in place with some adhesive bandage. You will not need to use additional materials to keep it in the place as the hoof boot will do this. Undo the zip fully and open the boot up as much as possible. Lift up the horse’s foot and pull the boot up and over the front of the hoof. Use the ‘V’ shaped indent (in the moulded part of the boot at the front) as a guide to where the middle of the boot is. Once you have pulled the boot onto the foot, let the horse put his foot down as this will help push the foot further into the boot. Ensure the boot is fitted centrally on the foot – you may find it easier to pick the foot back up and check that the moulded sole is straight and not crooked. If it appears crooked undo the zip, pick up the foot and gently swivel the boot around the foot until you are satisfied it is straight. The ‘V’ indent will help guide you with this. Check that the edge of the foot reaches the side of the boot and the bulbs of the heels are also encased within the moulded area, and not overhanging it. The stretch neoprene upper should fit snugly around the pastern area to ensure no bedding or mud etc can get inside the boot. If the upper is too tight, it is unlikely you will be able to do the zip up fully and this will be an indication that you have the incorrect size. If turning the horse out, ensure he is happy with the feel of the boot first. In the unlikely event the horse is nervous of the boot, walk him gently around his stable so that he can get used to it. They will soon realise it is comfortable and will not impede movement. "Such a great boot has made poulticing so much easier and quicker and means horse can stay out instead of having to stand in"
"Great product, good service but tables on the site give wrong size breakdown so I had to make 2 orders as they came too small. so quite frustrating. I know what size we need now though. Staff Comment: Please note, size guide and fitting information is now correct. Thank you for bringing this to our attention." "I have a youngster who has had to use the medical hoof boot twice in the last few months (we trialled the product). First time he was 11 months old and had a bruised sole as his feet were very soft. He had a few small holes in his hoof wall which I treated with Antibac® liquid and then stuffed with cotton wool on the advice of the farrier. He was still hopping as I walked him down to the field on the stony track and through the field which was rutted. I put the Woof Wear medical hoof boot on him (to prevent anymore stones penetrating his soft sole) and he wore it for a week, though it was removed each day when he was brought in for an hour or so to allow the hoof to breathe. After a week, he was able to go out without being sore on the stones at all. Two months later and he came in hopping again. The farrier came out and after some investigation, found another deep hole which she believed to be harbouring an abscess. She asked me to poultice it, to draw out any pus. Now since the last time he used the boot, my youngster has grown considerably and we found that he no longer fitted the size 1 medical hoof boot, so I had to do an old fashioned style poultice on him - what a faff! Not only did I use a lot more dressing materials, it became a 2 person job and my usually well behaved youngster became rather fed up, nipped the handler and leapt around the yard on three legs. Trying to hold the hot and wet Animalintex® on whilst applying the vet wrap was manageable but trying to wrap in duct tape to secure it in place was complicated. I have struggled with tape before which has then turned out not to be sticky enough, so I now have a very strong and sticky version. Poor pony was not impressed with the noise and amount of tape that seemed to be going on to his foot, needless to say we did get it on and it stayed on overnight. I managed to pick up a size 2 medical hoof boot, so this morning I went to remove yesterday’s poultice, getting it off was almost as much of a faff as putting it on! Trying to snip the outer material with the scissors, without cutting my youngster’s heels/coronet band was a challenge as he was still protesting. He was also still hopping lame. Today I was on my own, no handler to help me, so I tied him to the fence (yesterday he kept pulling back and breaking the string). I lifted his foot, re-cleaned it out and applied the hot Animalintex® and a much smaller amount of vet wrap, I then turned around so I was facing the same direction as him, pulled his leg forward and slid the medical hoof boot on. As he put his foot down he pushed his hoof further into the boot and I was then able to pick it up again and reposition it slightly so it was even. I replaced his foot to the ground and did the zip up – so much easier than yesterday and no arguing from him either. He immediately started walking on it better and will be turned out later today. Thank goodness for the WW medical boot, as it saves me time and money and saves my poor youngster the hassle of old fashioned poulticing. "